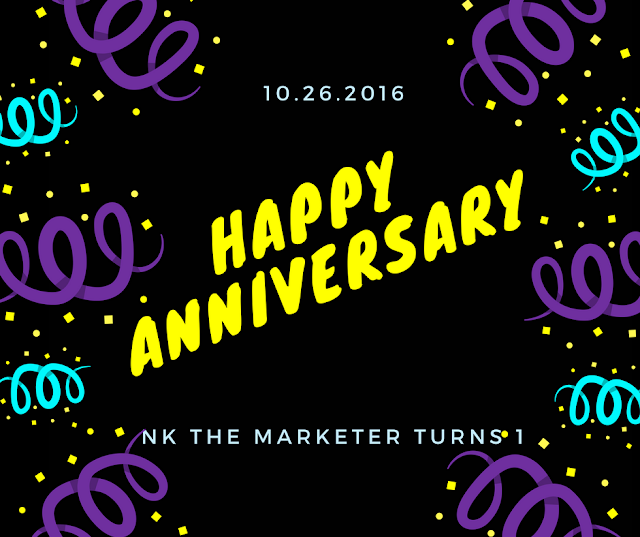 NK the Marketer: Happy Anniversary and a Big Thank You! "It is not happy people who are thankful; it is thankful people who are happy!" I started this blog for many reasons. I was extremely frustrated with my job search and wanted a place to document what I was learning so potential employers to see that I really knew what digital marketing entails. I also wanted people who look like me to know that this is a profession they could get into as well. Deep down somewhere, I knew I was leaving a live journal of how I persevered on a career path I love even though the journey wasn't easy. As time passed, it became a great a way for me to share little tips and tricks that those who were not on this journey would have access to. So I created and shared posts like "Free and Low Budget Ways to Increase Your Digital Marketing Acumen!" and "5 Ways to Brand Yourself as a Digital Marketer!" The blog was also a great way to share the wisdom and advice from the amazing marketers I was having informational interviews with or meeting at events. These spotlights have by far been the most popular posts, so we are going to keep them coming! What is NK Doing Now? What is Next for NK and the Blog? I intend to keep blogging for years to come. There is still a lot of great information in digital marketing for us to explore together. Oh, and let's not even mention the fact that everything keeps changing almost daily in this industry, so, there will not be a loss of things to write about. Please be sure to send requests of anything you would like me to research and write about: nanak@nkthemarketer.com. I want to make sure this is beneficial to the people who are "the wind beneath my wings." For the next year, I am going to keep bringing you marketer spotlights, social media platform reviews, course and certification reviews, a new series: campaign reviews, and more. Thank you so much for your support! A special thank you to my family, who heard me whine, helped me with proofreading, were my creative soundboard, and held me together when I didn’t think I would get this far! You rock! Successful corporate events desire good planning and proper execution. In truth, such events are necessary to manufacture a public picture of a company. To make our events successful, we need to invest plenty of time in selecting meeting space San Francisco and suppliers.